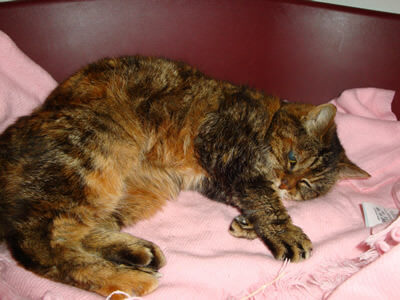 PENNY, age 17, domestic short hair, tabby/tortie. She is deaf and with little sight. She is very affectionate and loves a cuddle. She came to us following the death of her owner. She is now living very happily and enjoying plenty of love and attention in a home she shares with Harry, a blind cat, who's story appears on the Rehomed page.